Raita is the most versatile Indian accompaniment. They can be made by using vegetables, fruits or a combination of both. Make this seasonal special Mango Raita, that tastes heavenly or Yam Raita made using mashed yam and perked up with green chilli paste and freshly ground black pepper. Enjoy these tongue-tickling delights with Sama Pulao or Dahiwale Aloo Ki Subzi with Rajgira Puri and enjoy a complete meal even on fasting days. Also, if you are tired of having regular khichdi with pulses and grains then try these Potato Khichdi or Sweet Potato Khichdi made by grating the tubers and tossing with roasted peanuts. It is very easy to make and tastes amazing with Rajgira ki Kadhi. Who could have thought of Rajgira Paratha Canapés, mini crumbly parathas topped with stir-fried aloo ki subzi and topped with green chutney or Masala Sweet Potato Fries, that cook much faster than potatoes when deep-frying. Try these innovative faraali snacks and jazz up your boring faraal food! Satiate your evening hunger pangs with these tongue-tickling Faraali Pattice, Kand Tikki, Buckwheat Dhokla, Potatoes and Buckwheat Pakora , Sanwa Dosa with green chutney and Peanut Curd Chutney. You can stock up air-tight containers with crispy, thin Potato wafers and Kand wafers and enjoy them even on non-fasting days. They are any day better than the market bought wafers! 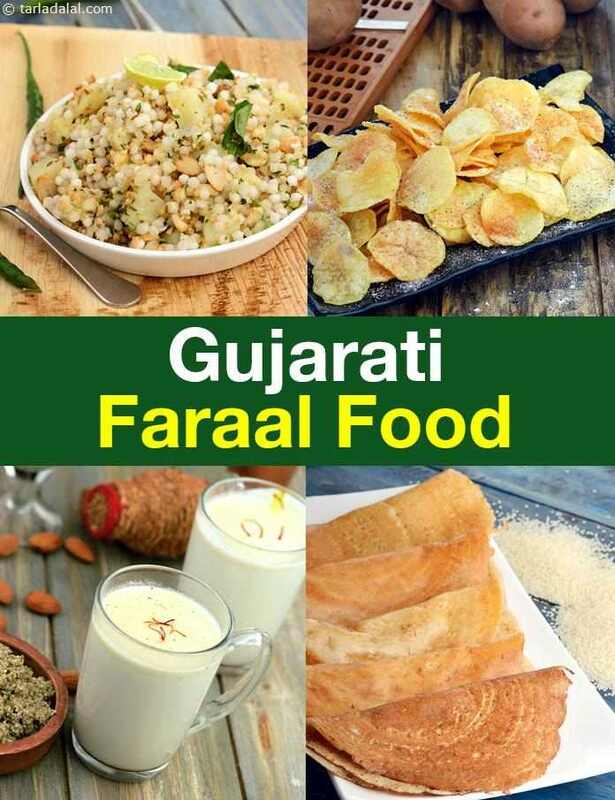 We hope you enjoy our collection of Gujarati Faraal Recipes. Given below are Gujarati recipe articles you will love.